Following an intensive period of training for war, the Battalion farewelled Brisbane by a march through the city departed by plane and aboard the HMAS SYDNEY for South Vietnam in May/June 1966. The Battalion arrived in time to celebrate its first birthday at Vung Tau on 6th June before moving forward to join 5 RAR in Phouc Tuy Province and entering service as part of the 1st Australian Task Force (1ATF). 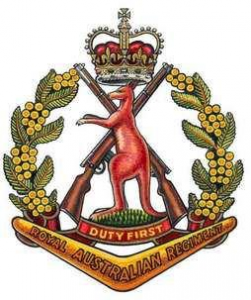 During the period June to August 1966, 6 RAR conducted two major operations. Operation Enoggera was a search and clearance of the previously unsettled village of Long Phouc, and Operation Hobart was a five day search and destroy mission. The two operations accounted for 36 enemy casualties and the destruction of several camp installations and caches. Operation Hobart also saw the Battalion come in contact with the enemy provincial Mobile Battalion D445 which was subsequently met and defeated at ‘Long Tan’. Operation Smithfield was opened by a mortar attack on the Task Force area on the night of 16/17 August 1966. ‘B’ Company was initially dispatched to clear the area to the east of the Task Force base. ‘D’ Company took over from ‘B’ Company on 18th August 1966. ‘D’ Company made contact with an enemy force of regimental size and were soon under attack from three sides. The battle was fought into the night under a blanket of mist and heavy monsoonal rain, but ‘D’ Company held its ground with heroism and grim determination. Armoured personnel carriers (APC’s) of 3 Troop, 1st APC Squadron with ‘A’ Company mounted hit the flank of a battalion size force which was forming up to assault the rear of ‘D’ Company inflicting many casualties and forced the enemy from the battlefield. A US Presidential Unit Citation was awarded to ‘D’ Company 6 RAR. During August 1966 and its departure to Australia in June 1967, 6 RAR took part in seventeen more Battalion operations and supported a number of 5 RAR operations. These operations, along with routine patrolling around the Task Force area, gradually wrested control of the Province from the Viet Cong (VC). 6 RAR accounted for 311 enemy KIA, 616 wounded and captured 13. Twenty-three members of the Battalion received gallantry awards for the tour and 37 gave their lives. 6 RAR handed over the camp to 2 RAR before returning home to a tumultuous welcome in Brisbane. 6 RAR embarked on its second tour of active service in South Vietnam on 7th to 9th May 1969 to relieve 4 RAR. Once in Vietnam the Battalion was renamed 6 RAR/NZ (ANZAC) Battalion on 19th may 1969. This reflected the inclusion of the New Zealand component of two rifle companies, two sections of mortars and two assault pioneer sections. The first Battalion operation was one of the most productive of the tour. Operation Lavarack commenced on 30th May 1969 with the establishment of a fire support and patrol base (FSPB) to the north of Nui Dat. Each company then commenced reconnaissance in force of separate operational areas. By the time the operations ended on 1st July 1969 there had been 85 contacts which cost the enemy 102 KIA and 22 WIA. The Battalion casualties were three dead and 29 wounded. The third anniversary of the battle of Long Tan was commemorated by a memorial service on the original battle ground during which a large cross was erected on 18th August 1969. During the tour 15 Battalion operations were conducted. Reflecting the increased control that the Australians exerted over the province, 6 RAR/NZ (ANZAC) was called on several times to assist in civil community projects and in the training of local government forces. Positive signs of the disintegration of the enemy’s command and supply system were identified and by the end of the tour the enemy were forced to operate in small groups only, and struggle for their very existence. As an indication of the success of the tour the enemy suffered 60 KIA and 64 WIA and captured 51 as a result of Battalion operations. The Battalion also captured 480 assorted weapons and 13 tonnes of rice. 6 RAR/NZ (ANZAC) received 28 gallantry awards for the second tour. Between April and May 1970 6 RAR returned once more to Long Tan Lines, Lavarack Barracks, Townsville. By virtue of the authority vested in me as President of the United States and as Commander-in-Chief of the Armed Forces of the United States, I have today awarded the Presidential Unit Citation (Army) for extraordinary heroism to D Company, Sixth Battalion, The Royal Australian Regiment, The Australian Army. D Company distinguished itself by extraordinary heroism while engaged in military operations against an opposing armed force in Vietnam on August 18, 1966. While searching for Viet Cong in a rubber plantation north-east of Ba Ria, Phuoc Tuy Province, Republic of Vietnam, D Company met and immediately became engaged in heavy contact. As the battle developed, it became apparent that the men of D Company were facing a numerically superior force. The platoons of D Company were surrounded and attached on all sides by an estimated reinforced enemy battalion using automatic weapons, small arms and mortars. Fighting courageously against a well armed and determined foe, the men of D Company maintained their formations in a common perimeter defence and inflicted heavy casualties upon the Viet Cong. The enemy maintained a continuous, intense volume of fire and attacked repeatedly from all directions. Each successive assault was repulsed by the courageous Australians. Heavy rainfall and a low ceiling prevented any friendly close air support during the battle. After three hours of savage attacks, having failed to penetrate the Australian lines, the enemy withdrew from the battlefield carrying many dead and wounded, and leaving 245 Viet Cong dead forward of the defence position of D Company. The conspicuous gallantry, intrepidity and indomitable courage of D Company were in the highest tradition of military valour and reflect great credit upon D Company and the Australian Army.